“. . . Your sons and daughters will prophesy, your young men will see visions, your old men will dream dreams” (Acts 2:17). Happy New Year! I just turned the page on another calendar year. It seems like last week I was hanging it up on the kitchen wall, and now I’m taking it down. Where does the time go? I’ve heard it said that time flies, but no one every told me it flew at the speed of light. It seems like only yesterday my sons were bouncing around on the floor, playing with cars and taking on the identities of superheroes. Do you know how hard it is tell Superman to brush his teeth and go to bed? Now both boys are married and have successful careers. Visions and dreams are a part of a child’s everyday life. Children dream about everything. As they hold out their hands and buzz around in a circle, they dream of flying. As they try on Mama’s high heels, they dream of growing up. Dreaming is a part of a child’s nature. But as we grow older, somehow the enemy dismantles those dreams and we accept whatever comes our way. I’ve tried to define the biblical difference between visions and dreams. The simplest answer is that visions occur while you’re awake and dreams while you’re asleep. One year ago this past November, I began to have an impression, maybe even a vision. This year, I’ll celebrate a generation of ministry: 40 years as a minister of Jesus Christ. That is a mile marker I’ll never reach again unless God tarries and I survive another 40 years. It will be the only time I celebrate a generation of what God has done in my life. I believe you need to become intentional in placing markers in your life, events to which you can always return. You remember them as though they were yesterday. Salvation is a definite marker. Baptism, your wedding day and the birth of a child—all are signposts along life’s highway. And as I looked forward to 2013, I began to think about how I should mark this special year. One day, I was talking to my good friend Keith Wheeler. 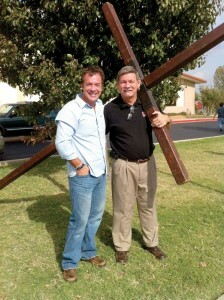 Keith has carried the cross more than 20,000 miles, 150 countries and all seven continents. He and I were talking about our world travels and what a gracious God we serve. I don’t know how it came up, but we began to talk about the possibility of carrying a cross to the top of one of the highest mountains in the world: Mount Kilimanjaro, 19,341 feet through five climate zones. I begin to have dreams about us carrying a full-sized cross up that mountain. As far as we know, no one has ever accomplished that feat. Mountains have a significant place in the Bible. The Ten Commandments were given to Moses on top of Mount Sinai. Noah’s ark ended up on Mount Ararat. And most people know about Jesus and the Sermon on the Mount. Can a man who is almost 62 years old, celebrating a generation of taking the Gospel around the world, haul an 80-pound cross up a mountain? You bet! I am not an athlete. I’m not a runner, and I don’t bicycle. In fact, I like to joke about my exercise program: “I sit in the bathtub, pull the plug and fight the current.” But dreams have a way of shaping your life. The first of August, 2013 will find me heading toward Dar es Salaam, Tanzania. Since most dreams can’t be accomplished alone, I’m putting a team around me. My two sons are going along to help their old man carry the cross. Little by little, other fathers are coming forward with their sons to ask, “Can we join you?” God is up to something special as He gathers His team. What does 2013 look like for me? For 221 of its days, I’ll travel to other countries preaching the Gospel, planting churches, raising up the next generation of missionaries and discipling young men and women. But by the time summer ends, I’ll be standing at the foot of a mountain, its top covered in clouds. The biggest journey of my life lies on the road to its summit. I need God to give me strength one step at a time. I cannot accomplish this tremendous task without Him or apart from the help of my friends. I am thankful God gives young men visions and old men dreams. When a man stops dreaming, he stops living. How big is your dream? Mine is only 19,341 feet tall. Happy New Year, and may God’s richest blessings be yours!